available to the semi pro consumer. Priced around $1000 or below these video cameras offer 4K video recording at a price that is within reach for most people. however if you are just starting out or you are on a limited budget this may be the list for you. 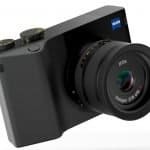 Improvements in this 4K camera include the new ZEISS Vario-Sonnar T Lens that is capable of capturing videos at 26.8mm wide-angle. Moreover, its optical zoom lens has been improved at 20x, for both HD and 4K. As for the image sensor, the FDR-AX53 is an Exmor R CMOS that supports UHD 4K at 24 as n30 fps with a pixel that is 1.6x larger than the older model. Equipped with a 3.0” Xtra Fine LCD with 921K dot resolution, this camcorder is also capable of a large screen playback. Other features include WiFi and NFC connectivity that allows control from another device, such as a smartphone and a tablet. 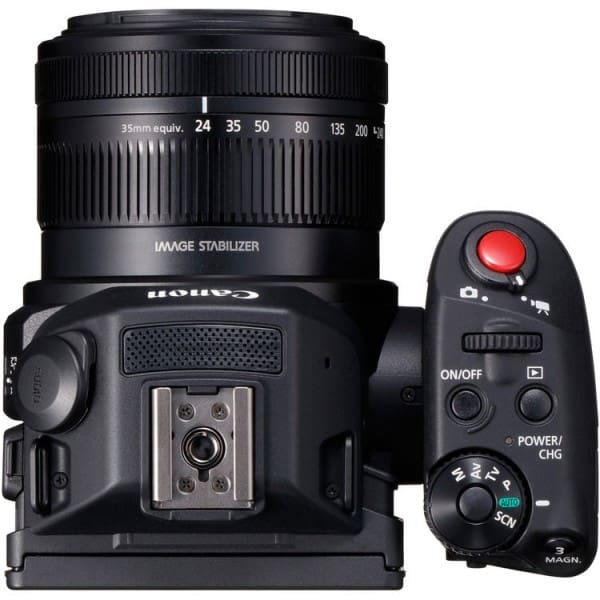 The Sony FDR-AX53 has an Autofocus system that is 40 percent faster and boasts of a Balanced optical SteadyShot image stabilizer with a 5-axis Intelligent Active mode which makes the AX53 to handle vibrations. Its 0.24” OLED Tru-Finder EVF is designed with 1,555K-dot resolution for high quality colors. As for the lenses, it is optically designed to use dual-surface spherical ones that allows for a 33-degree viewing angle. Other capabilities of the FDR-AX53 include large-screen playback via connection from an HDMI output port to a large screen. 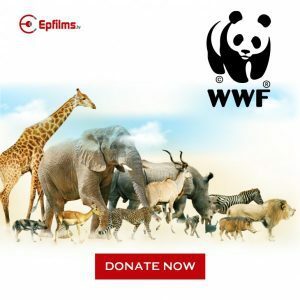 It is also possible to for the user to get a portion of a video recorded in 4K or image frame and enlarge it to occupy the whole screen in Full HD quality. Also, it supports live streaming to USTREAM and with its optional feature, Multi-Camera Control, it can be used with other Sony Handycam models that support this feature. The Panasonic HC-WXF991K is not only fully automatic but it also allows the user to change setting manually with its Multi Manual Dial feature. It also sports a ½.3” MOS sensor that is backside-illuminated (BSI) and loaded with an 8.29 megapixel resolution. The compact camcorder is powered by a Crystal Engine 4K image processor that supports 4K UHD video capturing at 24 and 30 frames per second as well as 1080p videos at 60 fps. 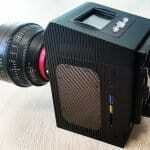 For shooting still images, this camera can accommodate shots up to 25.9 megapixels of interpolated still images. Moreover, it has the capability to extract still images from 4K video frames with the 4K Photo Mode feature. 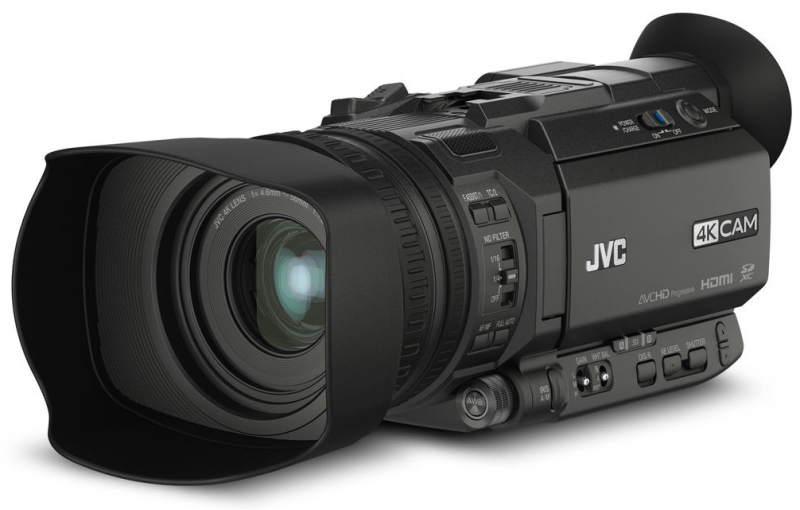 The JVC GY-HM170 is an entry-level 4K professional camcorder with Top Handle Audio Unit. Capable of Ultra HD recording, this compact pro cam is designed with custom-assign button, ND filters and audio inputs with manual gain control. It is equipped with a 0.24” EVF with 1.56 megapixel resolution. This feature makes it possible for the user to get high quality images even in broad daylight. An additional interesting feature of the HM170 is a flip-out LCD screen designed with a 920,000-pixel panel. 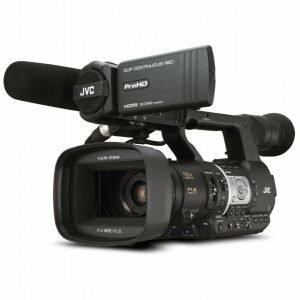 The professional camcorder JVC GY-HM170 features an HDMI port that makes it possible to attach an external monitor, perform external video recording and connect to a live switcher. The additional top audio unit boasts of XLR audio inputs for use with external microphones. This can be attached to the accessory shoe of the camera. Moreover, cable is not necessary because it already has electrical contacts that allow transmission of audio signals to the unit. The GY-HM170 is also capable of capturing videos in 3840 x 2180 4K in either 24 or 30 frames per second. Bit rate is at 150 Mbps and encoding the file can be done in a .MOV-wrapped H.264 codec. The camera also has available dual card slots that make it capable of video recording to either SDHC or SDXC formats. Video output of live 4K is possible via HDMI, making monitoring and connecting to an external recorder possible. Display is a 3/5 LCD panel and the viewfinder has a 1.56 million pixel resolution. For focusing, there is also a feature known as focus assist overlay that can help in capturing 4K videos with manual focus. The user-assignable buttons make it possible for the user to pre-assign or program frequently used settings to minimize the time needed to change menu settings each time. The Panasonic HC-VX981K boasts of an ultra sharp 4K Ultra HD recording feature and is capable of in-camera editing for 1080p displays. It also has LEICA Dicomar lens with optical 20x zoom range and it has over 6 million effective pixels on its sensor. 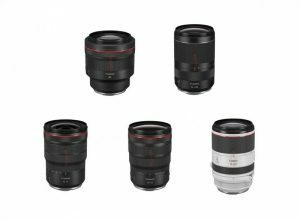 These are on top of its 5-axis Hybrid Optical Image Stabilization feature. These 5 axes include tilt, pan, roll axes, horizontal and vertical directions. 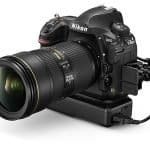 This image stabilization limits blurred video images and vibrations even without the use of other stabilizer or a tripod. As for the in-camera editing, user can crop, pan, zoom and stabilize the tracking of the subject, making editing less complicated. Another feature of the Panasonic HC-VX981K is the wireless multi-camera feature that makes it possible to record using other devices with the use of WiFi connectivity. This allows for picture-in-picture recording and at least three mobile devices can record simultaneously. The image sensor, on the other hand, is a ½.3” BSI MOS Sensor with 18.91 megapixels. 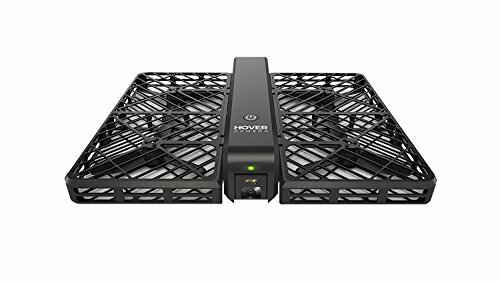 Recording is at 30 fps in 4K resolution and in MP4 format while the battery can last up to less than an hour of 4K footage recording. When it comes to combining two images taken with two exposure time, the High Dynamic Range Movie Mode makes it possible to suppress blown highlights as well as shadows to yield clearer videos. As for the built-in WiFi, it has another use. By connecting a smartphone, user can use it as a baby monitoring device and this feature can also send notification alerts when the baby is crying. The Sony FDR AX100 is a versatile shooting and video recording device equipped with a 1” Exmor CMOS sensor that is not only impressive when it comes to performance even in low-light conditions but also in reducing noise of up to 50% as opposed to its predecessors. It is also about eight times larger than that of what other camcorders have. This also results to the capture of cinematic images with shallow depth-of-field. This handycam is also equipped with a 24x Clear Image digital zoom as well as a 12x optical zoom, wide-angle Zeiss Vario Sonnar T* lens. These are on top of the camera’ other versatile features that set it apart from its competitors. 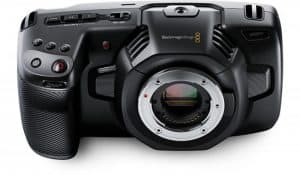 Potential owners will also be delighted with its Optical SteadyShot image stabilization feature, complete with Active Mode that allows for smooth video recording as well as a 3-Way-Shake-Canceling feature that enhances roll stability. For display, the Sony FDR AX100 boasts of a 3.5” XtraFine LCD that is touchscreen as well as a 0.39” high-contrast OLED EVF so shots or images can also be framed. It is also capable of WiFi connectivity and NFC support that enables controlling the camcorder remotely with a smartphone. Also, connectivity is made possible using a USB 2.0 cable, a Composite Video outpout and a Micro HDMI output. Other features include a lens hood, cap, rechargeable lithium-ion battery pack, power cord and AC adapter, among others. The Panasonic HC-WX970 is a compact video recorder that is surprisingly light at only 30 grams, making superior when it comes to portability. It is comparable to the Sony FDR AX33 model when it comes to size and weight. 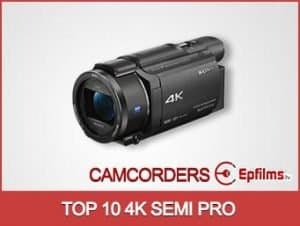 This 4K UHD camcorder has great handling features and easy-to-use settings that makes it ideal for field shootings, whether for professional users and amateurs as well. The HC-WX970 is considered to be one of Panasonic’s top of the line models which boasts of a secondary camera with a ¼-type MOS 5.27 megapixel image sensor. This makes it possible to rotate the lens and take pictures from two different angles. For display, a 3” LCD monitor is designed with a 460,800-dot resolution. As for the HDMI port, it has a micro format instead of the mini. Almost with the same design as the HC-W850, the power button, WiFi, Level Shot and Playback buttons, USB port as well as A/V and mic jacks, are in the same location. Considered as one of the first consumer-class 4K camcorder having a small frame, this device has a Leica Dicomar lens with 4 separate optical groups. Zoom range is 20x optical zoom and it is powered by the Crystal Engine 4K chipset. It can take 3840 x 2160 resolution videos at 30 frames per second. There is also an intelligent zoom feature that can be activated to maximize the zoom range to 25 times. Users can also take advantage of the Level Shot feature as well as the Hybrid OIS that has 5 axes. Aside from the 18.9-megapixel primary sensor, this camcorder also is capable of the High Definition Range function that result to more natural looking videos in situations where highlights and more balanced shadows are required. This is made possible by the capability of the HDR function to record two videos at different exposure times and then combining them into one clear stream. 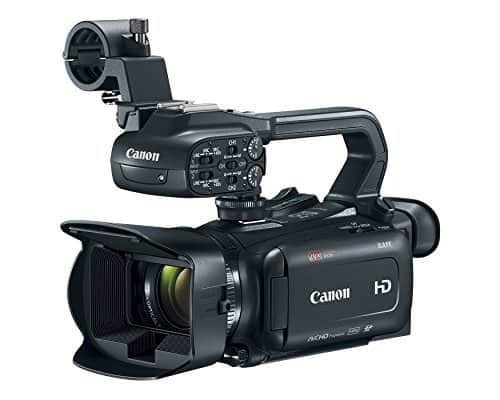 The Canon XC15 is a high-performance professional camera capable of Ultra HD 4K recording and is ergonomically designed for easy handling and portability. 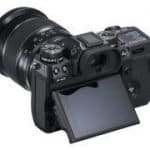 It boasts of a 1” CMOS sensor as well as a DIGIC DV 5 image processor that is powerful and with a 4224 x 3164 total resolution. This makes it possible to capture video footage at up to 3840 x 2160 and 4:3 still images in up to 12-megapixels. With the EOS-style mode dial, the camera does not have the traditional Canon look from the back because of the absence of viewfinder and rear dial. The opening for the memory card is located below the LCD display. The Canon XC15 is equipped with 8.9 to 89mm lens that has a 35mm equivalent focal length of 27.3 to 273mm in video mode. Conversely, in the 4:3 photo mode, it is 24.1 to 241mm. When it comes to video recording, compression is H.264 and for 1080i/p recording, bitrate is at 35 while Mbps is at 50. For UltraHD 4K, there are 205 and 305 Mbps modes that are dependent on the rate of the frame. The camera also has a 10x f/2.8 to 5.6 SLR-like manual zoom lens equipped with auto and manual focus capabilities. LCD display is 3 inches, with 1,030,000-dot and also allows for playback, monitoring and accessing the menu. The screen is also capacitative-touch sensitive that lets the user change settings that do not have dedicated buttons for such settings. The optical zoom lens is 10x and has zoom rings and dedicated focus feature. As for ISO range, it is wide at 100 to 20,000 and is also designed with shutter speed and iris control that makes it capable to adjust to different lighting environments. The Canon Log Gamma is responsible for subdued contrast and sharpness while the Wide DR Gamma is for emphasis of gradients from mid-range to highlights that offer up to 12 stops of DR. Shooting home videos these days are fairly easy, what with all the recorders that you can choose from, including a smartphone with a camera with an impressive sensor and high megapixel rating. But you are going to regret recording momentous events using a smartphone. First of all, the device is not designed primarily for shooting home videos, which means it doesn’t come with features essential for a crisp and clear recording. The same thing is true if you use a digital camera. Simply put, certain gadgets are made for specific functions, and using mere substitutes will not provide the same excellent results. 4K camcorders come in all shapes and sizes, with some classified as prosumer, professional, and consumer. 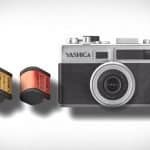 Even if you narrow it down to consumer cameras, you could still end up with several choices. But if you foresee using the device in various locations and in different conditions, go for something flexible and versatile. It has to be light and small enough to be portable. It must save in several video formats for compatibility. If anything, see that it saves in XAVC-S because it uses less media storage even when recording 4K at 30 fps. Video quality depends on a lot of factors, but what influences its recording detail is the size of the imager. The larger it is the finer details it can record. It also performs better in bright sunlight and in low light. The imager is the area that the light hits after it passes through the lens of the camcorder. The best imagers measure 1/3-inch or larger. So, if video quality, fine details and colors matter to you, look for a consumer camcorder with a large imager. Most camcorders have a single sensor, but if you want videos with better hues, saturation and brightness, check if a camera has a 3MOS imaging sensor. Instead of one, it has 3 sensors for each primary color — red, blue and green. This enables you to find the exact brightness and hues, and the saturation of each pixel. Moreover, it contributes to lower power consumption and better low-light shooting. Not all consumer camcorder will have everything you need to shoot a home video that will rival professional work. Some will have a larger sensor but smaller lenses, and vice versa. Only a professional camcorder will have both a large video imager and lenses. A camcorder with a larger sensor have better low light performance, while a product with larger lenses can help in low light situations. Since you may not have both, weigh your options between a camera with better low light performance and one that can adjust in low light situations. Which one matters more to you? Consumer 4k camcorders are now less expensive than they used to be. So if you were given a choice between HD and 4K, you should go for the latter. As already mentioned, it is the resolution that offers increased contrast and fineness. But that’s not all. With a video recorded in 4K, you can zoom in and out of the footage when editing and still retain full HD quality. Since each frame of a video is similar to an 8 mp picture, getting stills would have excellent quality. When it is converted to HD, the playback would have a much better quality than regular HDTV. In the past, shooting a moving subject can be dizzying for both the cameraman and the viewer, what with the blurring that goes on. But this has changed with the introduction of the imagine stabilization (IS) technology. Now, you can use the zoom lens, walk or ride a car while recording, and still get to retain the quality of the video. No more blurring when you pan the camera from one side to the next. It basically compensates any movement of the camcorder by providing you with sharp and clear videos. Considering that most consumer 4K cameras are handheld, IS is extremely important. Take note, however, that IS in cheaper devices, may not perform as well as those in more expensive gadgets. Making videos could be a bit jerky and any shaking could be magnified. So make sure to check the quality of the IS before you pay for anything. Sure, connecting a camcorder to your computer using a USB cable is not that hard, but it would be more convenient if you can just transfer recorded videos wirelessly or directly to social networks. This is why a built-in Wi-Fi is a must-have. If you plan to invest on a consumer 4K camcorder, might as well go big. This feature not only lets you transfer files to your smartphone, laptop or other mobile devices, but also allow you to stream videos directly via UStream and remotely control a camcorder. Keeping these considerations in mind, you could be well on your way in choosing the most suitable consumer 4K camcorder for your needs. If you really want to keep a record of family adventures, graduations and other special occasions that you can boast about, you should use a crystal clear 4K camcorder. 4K or 4K resolution refers to a horizontal resolution on the order of 4,000 pixels. In terms of recording, it resolves fine spatial detail that other resolutions fail to achieve. Shooting a hair commercial using a 2K and 4K camcorder, will show that the latter will be able to display the finer details of the hair clearly and sharply. When the video is transferred to DVD and Blu-ray, there will be an increase in fineness and contrast. Also, the reason that cinematographers prefer to record at 4K is that whatever resolution loss that occurs during video processing can be offset using the Super 35 film format. So, even if you’re no professional, using a 4K camcorder will prove beneficial even in the near future, when all you want to do is to run a playback of all the home videos you’ve recorded. But with all the products available on the market, and from well-known brands at that, choosing the best one for you could be challenging. 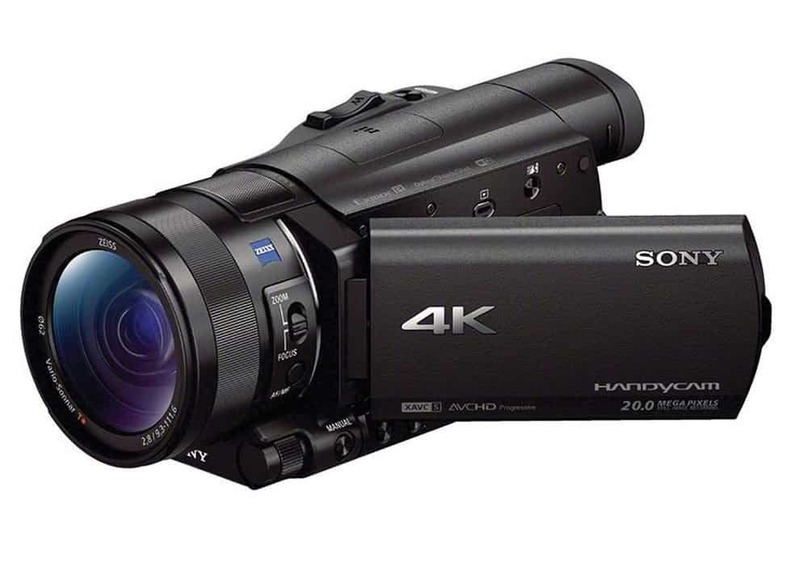 The FDR-AX53 4K camcorder is Sony’s latest semi pro 4K camera to be released. Take a look at the test and review to see what improvements have been made over the FDR-AX33. 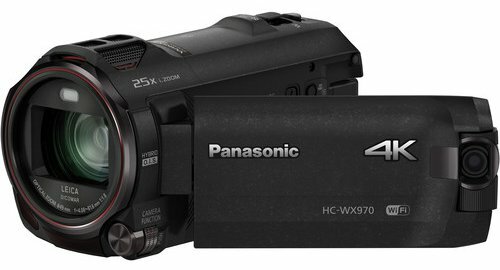 The HC-WX970 is the first consumer 4k camcorder to be released by panasonic. Along with being able to film in 4K @ 3840 x 2160p / 30 fps this camera is equipped with slow motion video of up to 240FPS ion 1920X1080. The WX970 is a great camcorder for anyone just starting out who wants a 4K camcorder without the expense. The WX970 has a a second built in camera that films you while you are filming. 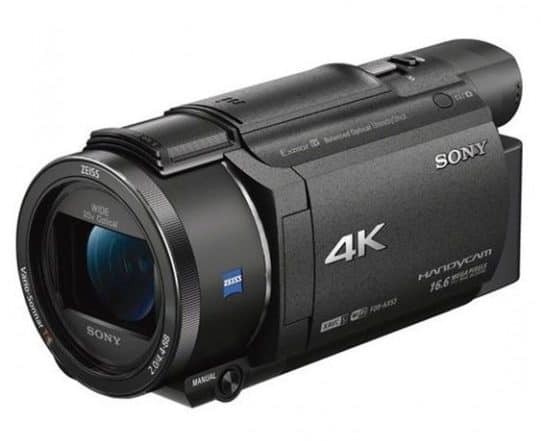 The FDR-AXP33 4K camcorder is Sony’s second semi pro 4k camera to be released for the mass market. It records at 3840 X 2160 through its Zeiss Vario Sonnar T Lens. For someone who wants a 4k camcorder but doesn’t want all the professional features of the more expensive models the AXP33 is a good first choice to look at. The FDR AX100 is the first 4k camcorder to be released to the mass market by Sony. Uniting 4K capability, intuitive controls and handheld size for the very first time, the FDR-AX100 is a big step in the fanatical 4k camcorder market. The FDR AX100 does cost a little more that the others on this list but it does have advantages for semi professional hobbyists. The Panasonic HC-VX8760 is basically the same camera as the WX970 but the 870 doesn’t include another camera to capture a second angle for picture within picture. However you can still do picture within picture using your smart phone and the built in WIFI on the camcorder. The is the cheapest entry level 4k camcorder and offers most bang for buck.